Our women's 40-44 world champion is Beate Goertz, who did her first Ironman in Austria earlier this year, where she finished third overall today. We believe that Tatiana Vertiz just won the 18-24 women's age group here today. We just saw her cross the line. Vertiz finished second by just one minute last year to Lindsay Wohlers. The bike cut off is coming ... and the word is that one athlete is a mile away and might not make it. RT @MilitaryCycling: Congrats to all military finishers! @jim_gourley: In #IMKONA 's military division, it's Army/AF/Navy for the men, AF/CG/Navy for the women! Loving the #IMKona finisher and in race pics. Ticked I stopped out of training for #IMCozumel. Inspiration for 2011. How fast was this day? There were 458 competitors under 10 hours! That's roughly a quarter of the field. The women's 65-69 update ... Gruenfeld retakes the lead! She's the defending champion in that age group and has managed to get past Natalie Grabow out on the marathon course. It was a tough day in the office for the New Zealand athletes in a super-hot, super-fast race at the Ironman World Championships in Hawaii today. The New Zealanders were all out of the top 10 with Australia’s Chris MacCormack winning the men’s race for his second time while compatriot Mirinda Carfrae took out the women’s honours when overwhelming favourite Chrissie Wellington withdrew with illness just before the race. The kiwis were unable to match the blazing pace and the blazing conditions with Cameron Brown the best of them in 17th place in a solid performance where the top 10 men all went under the 8hr 30min. Terenzo Bozzone finished close behind in 20th place in 8:38.23. The kiwi pair had a hand in the win though as training partners with MacCormack over the recent weeks. It was a tough time for the women too with Jo Lawn finishing out of the top 10 for the first time in several years, coming home in 20th place in 9:43.08 while Gina Crawford did not finish. “I am feeling a little sorry for myself. I swum well and rode ok, coming in with the big bunch along with Craig Alexander, the defending champion,” Brown said. Brown said he is looking forward to a break before resetting his goals with a similar story for Bozzone, who was hoping to improve on his 11th placing last year. “I felt so great coming in. I thought I had done everything right. The swim went well and I was going okay on the bike until the last 50km when the wheels fell off. “At the 15km mark on the run the legs started to feel it and believe me that’s not the place you want to be struggling here in Kona. Bozzone said he will take a break now and set himself for the Kellogg’s Nutri-Grain Ironman New Zealand, after confirming his entry earlier in the week. McCormack broke clear of Andreas Raelert (GER) after a great duel on the run to record the seventh-fastest time in history of 8:10:37 to give him his second triumph at Kona-Kailua after winning in 2007. Carfrae broke her own run record, clocking 2:53.32 for the marathon on her way to winning in 8:58:36, which was the fifth fastest time in history. She beat Swiss Caroline Steffen, who finished second behind Lawn at the Port of Tauranga Half Ironman earlier this year, by more than seven minutes. McCormack took the lead just after halfway through the run but was caught by Raelert with the pair running side-by-side for several kilometres towards the finish. The Australian surged at the final aid station down Pilani Hill to grab victory in what was the fourth fastest time in history. Marino Vanhoenacker (Belgium) was third less than three minutes behind McCormack. Unfortunately we won't have any finishers in our women's 70-74 category today - neither Mickie Shapiro or Bobbie Williams appear to have made the bike cut off today. We'll probably see them again here in Kona to give it another shot, though. Clayton Treska, the amazing marine who only got out of hospital in August - he's still undergoing treatment for stage 4 testicular cancer - is running well through 10 miles, we've been told. The story of my 31 yr old cousin with Stage IV cancer doing the Kona Ironman #IMKona, please RT. tinyurl.com GO CLAYTON! Getting late, but still VERY worth tuning in to #IMKona feed!! Rajesh Durbal just came across the line. He was born with a congenital deformity of both lower legs and his right arm and had his legs amputated when he was just a year old. 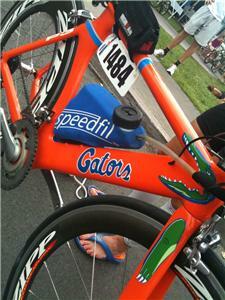 He's competed in sports almost his entire life, and did his first triathlon a last year. Today he finished the Ford Ironman World Championship - an incredible achievement! Way to go Robbie Little! He just finished the Ford Ironman World Championship for the second time. Andrew Eldridge, an amputee athlete competing here at the Ford Ironman World Championship, just came across the line - a sub-15 hour performance here in Kona! Clayton Treska finishes! The amazing marine, who is still undergoing treatment for stage 4 testicular cancer, just came across the line. He only came out of the hospital in August. 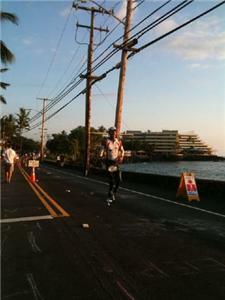 He was still in hospital, undergoing chemotherapy, when he finished Ironman 70.3 Hawaii. Earlier this week he told us he wanted to inspire other people with cancer. "You can't ever give up," he said. He didn't today - he's become an Ironman. Harriet Anderson finishes again! So much for our report that she hadn't made the bike cut off! The 75-year-old finished this race last year despite a dislocated shoulder. Today it looks like she got through the race relatively unscathed, and with over 40 minutes to spare! The winner of the first Ironman, Gordon Haller, just finished the race. The 60-year-old will forever hold an important part in the history of both this race and Ironman racing.